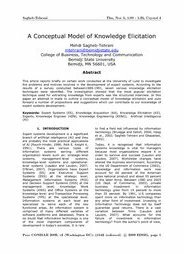 Recommended Citation: Sagheb-Tehrani, M. A Conceptual Model of Knowledge Elicitation. In The Proceedings of the Conference on Information Systems Applied Research 2009, v 2 (Washington DC): §1542. ISSN: 0000-0000. This article reports briefly on certain work conducted at the University of Lund to investigate the problems and motives involved in the development of expert systems. According to the results of a survey conducted between1989-1991, seven various knowledge elicitation techniques were identified. The investigation showed that the most popular elicitation technique used for extracting knowledge from experts was the structured interview. In this paper an attempt is made to outline a conceptual model of knowledge elicitation and puts forward a number of propositions and suggestions which can contribute to our knowledge of expert systems development.